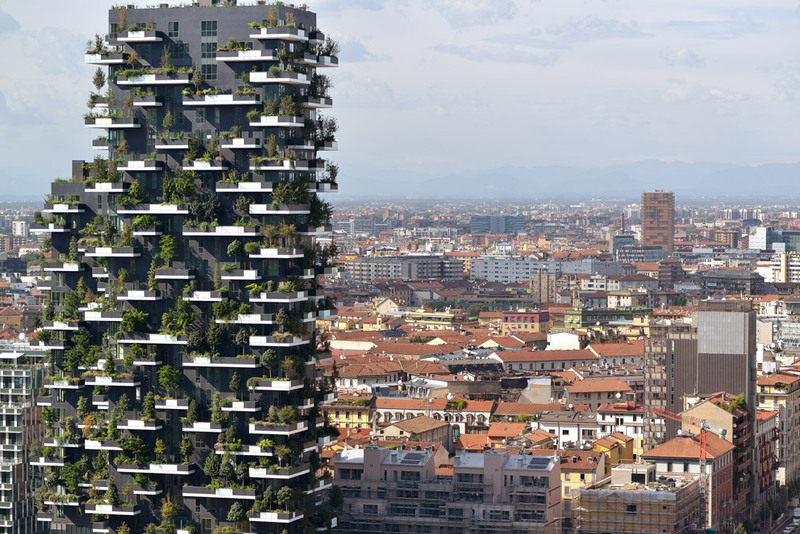 A total of 900 trees and other plants envelope the two towers in North Milan, the one 80 meters, the other 112 meters high, their black facades interrupted by irregular balcony projections on which the plants grow. 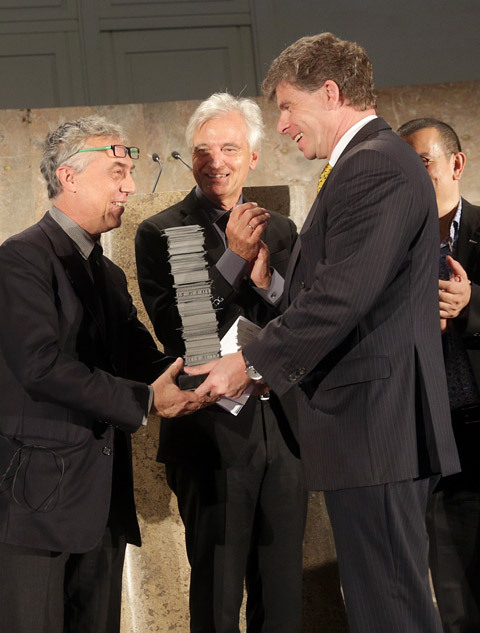 In this way, Stefano Boeri who alongside working as an architect has also been editor of “Domus” and “Abitare”, has greened almost a hectare of space in the district round Via Federico Confalonieri – and has thus solved various problems all at once. 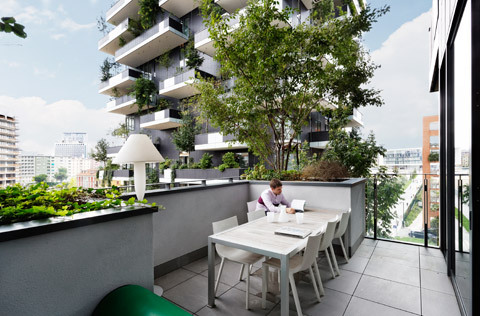 On the one hand, the plants improve the microclimate in Milan, one of the European cities with the highest population densities per square kilometer – and very little greenery at all. On the other, the hanging gardens bring urbanites who are otherwise surrounded by technology and sealed surfaces, back into contact with nature. “Everyone has their own forest,” the press folder tells us. Lengthy research was conducted with botanists and garden designers before realizing the project. For example, the trees had to survive tests in a wind tunnel and a special type of soil with a lot of lava in it was purpose-developed for the plant containers. The plants are fastened in place to prevent them flying around when the wind gets up, are also nurtured by an ingenious irrigation system, and there are staff gardeners who tend them regularly. For the inhabitants enjoy the greenery, but don’t themselves need green thumbs, as caring for the high-rise plants is a discipline in itself. The fact that the apartments weigh in at 9,000 euros per square meter or more is a different story altogether. 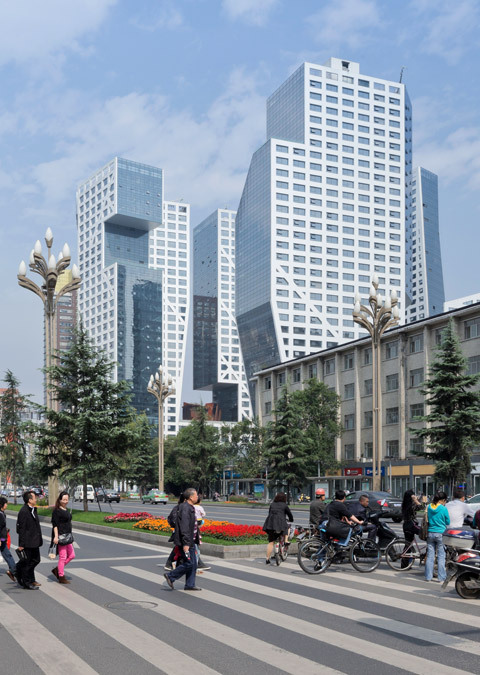 Boeri comments that he is currently developing a similar residential block in China that is destined to be affordable for quite different social strata, too. 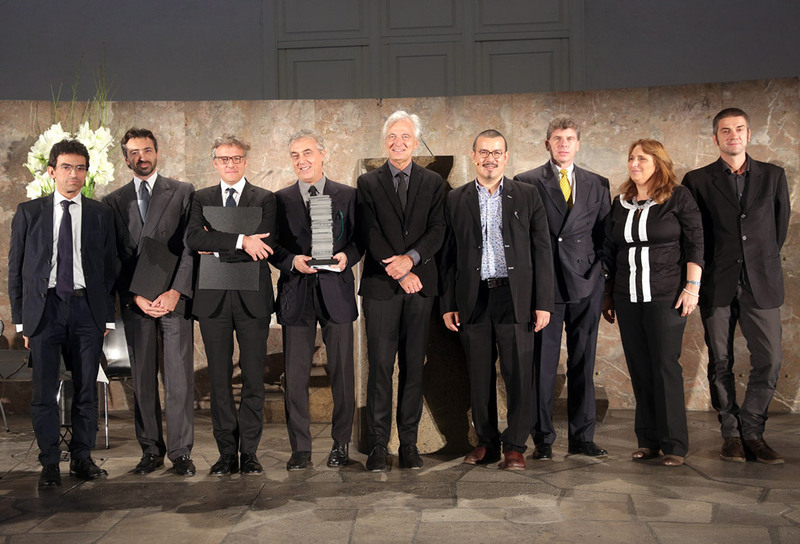 If one considers past IHA winners, such as “1 Blight Street” in Sydney by Michael Ingenhoven (2012), “The Met” in Bangkok by WOHA Architects (2010), the “Hearst Building” in New York by Foster+Partners (2008), “Torre Agbar” in Barcelona by Jean Nouvel (2006) and “De Hoftoren” in The Hague by Kohn Pedersen Fox (2004), then “Bosco Verticale” definitely stands for a new kind of architecture: The focus here is less on some audacious aesthetic gesture or outstanding engineering achievement, and more on an innovative form of living – which is fast becoming a key concern of architecture given climate change, energy issues and social challenges. 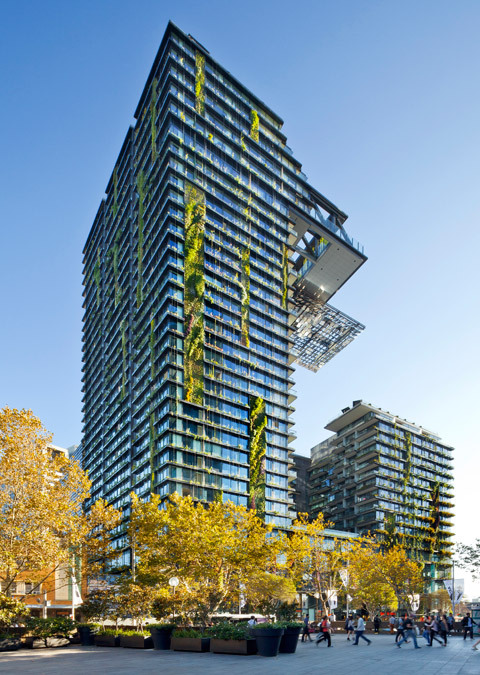 Logically, the projects by the other four finalists also offer ecological benefits: “One Central Park” by Jean Nouvel in Sydney, Australia, has a floating panel of solar that provides shade for a central area below and also cuts energy costs. 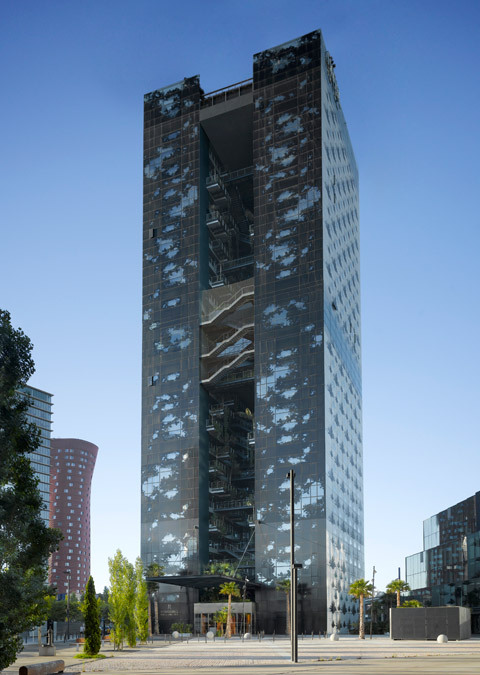 “Barcelona Fiera Hotel”, another Jean Nouvel brainchild, features gardens on the inside and outside to improve the building’s climate. 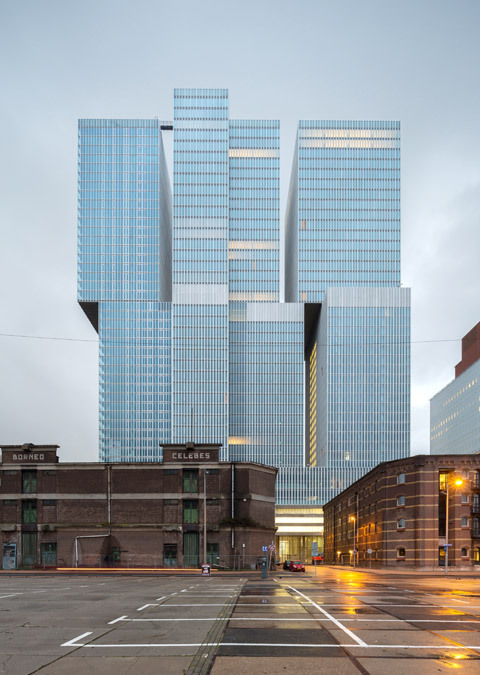 And even the massive “de Rotterdam” by Rem Koolhaas (OMA) and the “Sliced Porosity Block” in Chengdu, China, by Steven Holl, which with its inter-angled silhouette is probably the most zeitgeisty piece on the short-list, include sustainable, energy-efficient aspects. 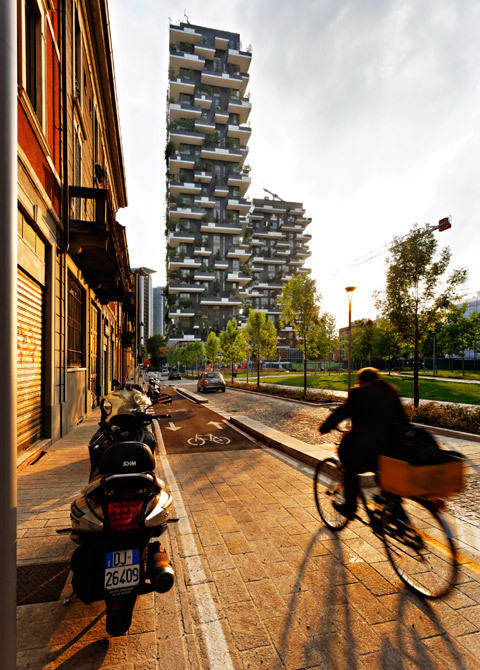 At any rate the “Bosco Verticale” certainly does not seem that far removed from the idea that we humans once lived in trees and overnighted in nests, which Michael Ingenhoven mentioned in his speech in praise of Boerri as being one of the fundamental tasks tackled by architecture. Not that this high forest is the first of its kind, as one only needs think of Ot Hoffmann’s “Tree House” in Darmstadt in 1971 and the current urban (guerilla) greening movement. Which probably bring us back to that old chestnut that the further we move away from nature, the more we yearn for a way back to it. And however good the approach is, it doesn’t answer the question of whether here the eco-friendliness is not superficial. 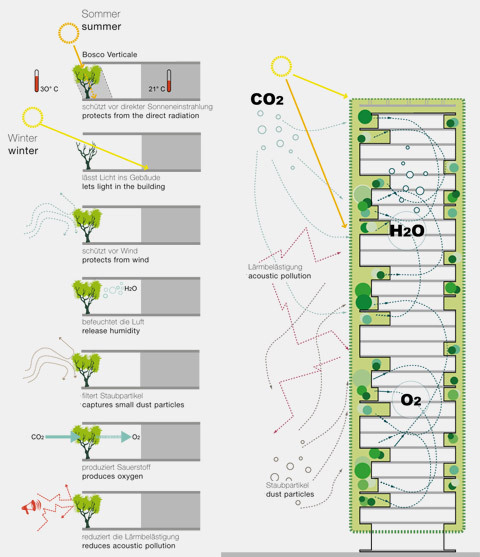 After all, a high-rise full of plants and trees at some vertiginous height needs a massive amount of energy to operate, not to mention the expenses involved in realizing it. Is there really a climate plus below the line, as the architect, developer and jury blithely suggest? Or is it just “green window-dressing” that makes you like living in the towers all the more and think you’ve done something good for the environment?